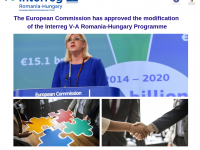 The European Commission approved on the 7th of March 2019 the modification of the Interreg V-A Romania-Hungary Programme. 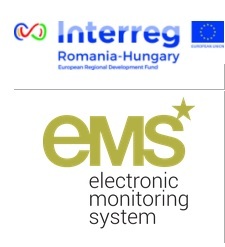 Following the launching of all available funds and on the basis of a detailed analysis carried out with external expertise, on the 10th of August 2018, the Managing Authority initiated a modification request of the Cooperation Programme through the Commission’s electronic data exchange system. 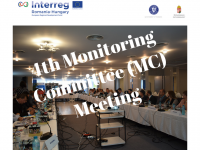 The Interreg V-A Romania-Hungary Programme is pleased to announce that with the occasion of its 4th Monitoring Committee (MC) Meeting, held on June 28-29, 2018 in Arad, Romania, very important decision has been made in what concerns the financing of 10 Concept Notes, under the Restricted Calls, worth 50% of the total ERDF programme budget, i.e. more than 94,5 mil. EUR, ERDF. 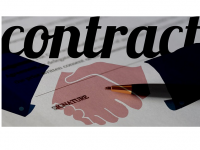 As we already announced on our website, the first financing contracts of the approved projects from the 1st Open Call were signed by all parties, thus marking the start of the implementation of the projects. While this is a beginning of a very exciting period, it is fair to state that from now on beneficiaries have to obey several regulations and provisions through all implementation period. 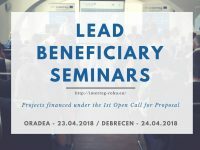 Seminars for the lead beneficiaries of the projects funded under the first Open Call. The Interreg V-A Romania-Hungary Programme announces the signing by the Ministry of Regional Development and Public Administration of Romania as Managing Authority of the first 4 financing contracts related to the first Open call, the total value of the projects exceeding 4.5 million Euros. We are happy to announce that with the launching of the 3rd round of Calls, the entire remaining Programme financial allocation, i.e. 90,595,062.00 EUR ERDF, has been made available, for both normal and strategic projects. 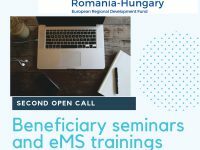 In this context, the Programme organised, between November 06-10, 2017, a series of 8 Information seminars, 1 for each of the two active Calls, in 4 different locations, and a Partner Search Forum, for the Open Call. A total number of 228 participants, from both countries attended the events. 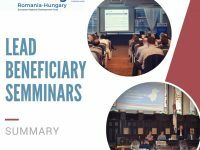 For the applicants submitting projects within Investment Priorities that fall under State aid incidence, the Joint Secretariat of Interreg V-A Romania-Hungary created a dedicated e-mail address: stateaid@brecoradea.ro. 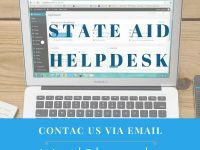 Feel free to submit your questions regarding State aid issues in order to get appropriate answers and recommendations! 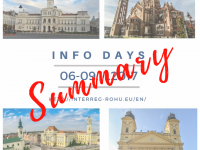 On May 05 2017, the Ministry of Regional Development, Public Administration and European Funds, acting as Managing Authority for the Interreg V-A Romania – Hungary Programme, launches for public consultation, the Guide for Applicants for the third Restricted Call for strategic projects proposals, within Interreg V-A Romania – Hungary Programme. 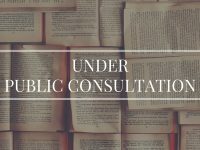 In this context, stakeholders are invited to get involved in the consultation process and express their views and suggestions regarding the Guide, by sending them until the 6th of June 2017, to the following e-mail addresses: rohu@mdrap.ro and joint.secretariat@brecoradea.ro . 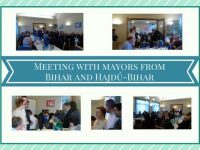 At the invitation of Oradea Metropolitan Area, the Joint Secretariat participated yesterday, on the 1st of March 2017, in a joint meeting of mayors from Bihor and Hajdú-Bihar counties. The meeting took place in Borş Commune and gathered about 60 participants coming from both countries, Romania and Hungary. This section is only available in English; all data uploaded in the present section shall be provided in English. Suscribe to our Newsletter, in order to know the lattest news about the Programme.